State Highway 99, also known as the Grand Parkway, is a highway in Texas, United States that opened its first section in 1994. When State Highway 99 is complete, it will be the longest beltway in the U.S., and the third (outer) loop within Houston–The Woodlands–Sugar Land metropolitan area, with Interstate 610 being the first (inner) loop, and Beltway 8 (Sam Houston Tollway) being the second (middle) loop. The proposed 170-mile (270 km) loop has been divided into 11 separate segments for construction and funding purposes. SH 99 was designated on August 18, 1924 from San Angelo to Fort Stockton. On June 25, 1929, SH 99 had extended to Alpine. On March 2, 1932, and a spur to Sherwood, SH 99A, was added but was maintained by the county. On July 23, 1934, this route was transferred to SH 10, and SH 99A was cancelled by then. On October 29, 1960, a new route was made for SH 99, going from Denton to the Oklahoma line as a renumbering of SH 10, to match OK 99 at its border. On April 29, 1968, this route became part of US 377. On October 25, 1984, SH 99 was designated along a very similar route to today's, but ending at SH 146 (Loop 201 until March 28, 1996) and Spur 330. On March 28, 2002, SH 99 was rerouted further east along a new route south to Spur 55 and along Spur 55 to Business SH 146. Spur 55 was cancelled, but it was not effective until completion of that section of SH 99 in 2008. Segment A is a planned segment that will go from SH 146 to I-45 South. The completion date is unknown. Segment B Construction began in January 2019 and finish in late 2023. This segment extends from I-45 South to SH 288 South. Segment C Construction began in August 2016 and will finish by 2025. This segment extends from SH 288 South to I-69/US 59 South. Completion date may be delayed due to Hurricane Harvey. Segment D, the first section opened, runs from just north of Interstate 10/US 90, west of Houston, south to Interstate 69/US 59 in Sugar Land where it terminates and intersects with FM 2759. The portion of this segment south of the interchange with the Westpark Tollway is now a four-lane divided highway feeder road, with maintains crossing over the Westpark Tollway. The 18-month-long construction of two ramps connecting westbound I-10/US 90 to southbound SH-99 and northbound SH-99 to eastbound I-10/US 90 was completed in 2011. The occasional traffic jams at this intersection prompted the sped-up construction of the ramps before the through lanes of SH-99 were built through the I-10/US 90 interchange. Two more ramps connecting southbound SH-99 to eastbound I-10/US 90 and westbound I-10/US 90 to northbound SH-99 opened as part of the construction of Segment E in December 2013. A final ramp connecting northbound SH-99 to westbound I-10/US 90 has been completed and is operational. Between the Westpark Tollway and I-69/US 59, Fort Bend County has constructed toll overpasses at nine locations along Highway 99. Motorists are charged around 35¢ to use each overpass, or can bypass the toll by using the current roadway through the signalized intersections. Overpasses between I-69/US 59 and US 90-Alt opened on February 27, 2014, Airport Boulevard and Harlem Road on March 18, 2014, and Mason Road and Bellfort Street on March 30, 2014. The rest of the tolled overpasses to I-10/US 90 opened in late April 2014. A TXDOT study is currently underway for Segment D of the Grand Parkway. The study includes looking at ways to reduce traffic in the original segment of the non-tolled portion of the freeway; this includes the possibility of adding continuous feeder roads. This segment has been open since 1994 and population, and thus traffic, in the surrounding area has increased exponentially. There is no timetable on when or if any new projects will come out of this study. September 2011 construction began on Segment E connecting I-10/US 90 Katy Freeway in the south to US 290/SH 6 and opened in December 2013. On June 3, 2008 the Harris County Commissioners Court voted to fast track the construction of Segment E with construction to begin in 2009 and then came the addition of $150 million in Stimulus money yet still the project stalled. As with many Stimulus projects it turned out not to be "shovel ready" enough and the $150 million was sent back to TXDOT for use elsewhere. In 2011 the Wetlands permit from the Army Corp of Engineers was acquired. In addition, Harris County relinquishing its rights to TXDOT who will construct a Public Private Cooperative toll road. At its April 28, 2011 meeting TXDOT allocated $350 million and the construction permits were let in July 2011. On July 28, 2011 TXDOT reported that three out of four contracts for Segment E were awarded and that construction would start by early September 2011. The multi year reconstruction of I-10/US 90 was completed in 2008 while US 290/SH 6 reconstruction was not due to even start until 2011. " The 22-mile (35 km) long section of I-10/US 90 from the suburb town of Katy to just inside the I-610 loop has expanded it to handle the rapidly expanding western suburbs of Houston not just adding lanes, but also an expanded HOV with two lanes in both directions where there was one lane reversed back and forth with rush hour and a toll lane for commuters willing to pay congestion prices for the quicker ride. The idea put forth is that Segment E is toll-viable from the start meaning it would pay for itself with tolls collected because of the need to relieve traffic on US 290/SH 6 along with the continued expansion of the western suburbs. After US 290/SH 6 construction is completed and less traffic is diverting down the E Segment of the Grand Parkway; the reasoning is that the inevitable population explosion going on in the area would not just replace the lost traffic from the US 290/SH 6 completion, but increase its use. Segment F-1 connects US 290/SH 6 to Texas State Highway 249. Construction began June 2013 and was completed and opened to traffic on February 5, 2016. Segment F-2 connects Texas State Highway 249 with I-45. Construction began on Segment F-2 in June 2013. A one-mile section of frontage road lanes between I-45 and Holzwarth Road (near the ExxonMobil Campus in Spring) was completed and opened to traffic in April 2015. The remainder of Segment F-2 opened on February 5, 2016. Segment G connects I-45 with I-69/US 59 North. Construction began June 2013 and was completed and opened to traffic on March 29, 2016. An interchange with the Hardy Toll Road to the Grand Parkway was completed on July 18, 2016. Texas Transportation Commission members met in Pasadena on 26 June 2015, and one item on their agenda is soliciting interested builders to develop, build and maintain the next 37.4 mi (60.2 km) Grand Parkway segment from Interstate 69/US 59 north of Houston to Interstate 10 east of the city. The project, which began construction in January 2018, is expected to cost $1.2 billion. 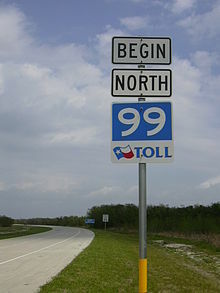 TxDOT began collecting tolls on this segment on November 1, 2011. Motorists are able to pay tolls using any of the Texas toll tag transponders (TxTag, EZ TAG or TollTag), the K-Tag (Kansas) or the Pike Pass (Oklahoma). No cash or mail payments are available on this segment. Tag reader gantries have been installed on the mainline just south of FM 565, and on the northbound entrance and southbound exit ramps at FM 565. Tolls will be $1 for two-axle vehicles. Future sections of the Grand Parkway will be built as tollways. The next sections to be constructed are Section C along with Sections H and I-1, which will include improvements/upgrades to the existing portions of Section I-2. Current residents who live along the Grand Parkway in Harris and Fort Bend counties (namely in the Cinco Ranch/Falcon Point areas within segment D) have noticed increased noise due to expansion of the highway, which includes construction of new overpasses as well as increased growth in the surrounding area. Sound barriers have not been constructed based on a 30+ year old environmental study. Resident petitions and protests for a new sound barrier study have not been addressed and Texas DOT claims "This section of the Grand Parkway does not qualify for that." Further expansion in this area is planned to start in 2010 with two tollway lanes added in each direction. Some groups in some neighborhoods are opposing the idea of the Grand Parkway going through their neighborhoods. For instance, a group called "United to Save Our Spring" is trying to stop the Parkway from going through a neighborhood off FM 2920. Residents in other unincorporated areas such as The Woodlands have not shown the same opposition and support the construction of the Grand Parkway, namely segments E, F-1, F-2, and G, as this would give residents living in the outer suburbs a toll road option to drive to San Antonio, Austin, northeast Texas, or Louisiana without having to drive through the city of Houston, or using Sam Houston Tollway (Beltway 8) to bypass around the city. Some residents in Brazoria County, along segment B, have voiced opposition to several of the proposed alignments. However, TxDOT has recently proposed a fifth alternative alignment to the north of Alvin. This alternative is acceptable to the opposition group Citizens Against the Grand Parkway and is likely to encounter much less opposition from the community. The controversial segment A, which would stretch from Texas State Highway 146 to Interstate 45 southeast of Houston through a very developed area, has not been fully designed yet. Texas Highway 146 is a possible route of the highway during segment A, but TxDOT has released plans for the highway to intersect I-45 from the west at its intersection with FM-646. If the highway continued south on Highway 146 to its intersection with FM 646 (Supposing the highway was built along the route of FM-646), it would eventually have to pass through the town of Kemah, which could not support a large highway unless many businesses were destroyed. I-69 / US 59 / FM 2759 / Crabb River Road I-69/US 59 exit 105. I-10 (US 90) – San Antonio, Houston I-10 exit 743B. Tuckerton Road Road not connected yet. SH 249 / Tomball Tollway / Boudreaux Road Access to Tomball Tollway via Frontage Road. I-45 south – Houston Access to I-45 Southbound via Frontage Road, exit 71. I-45 north – Dallas Direct Ramp to I-45 Northbound, exit 71. Hardy Toll Road south No exit to northbound Hardy Toll Road. Birnham Woods Drive Westbound traffic to Rayford Road must use this exit. I-69 south / US 59 south / Loop 494 / Community Drive, Valley Ranch Boulevard – Houston I-69/US 59 exits 157A-B northbound; eastbound exit and westbound entrance; temporary access to Loop 494 via Community Drive. I-69 north / US 59 north – Cleveland Direct Ramp to I-69/US 59 Northbound, exit 157 southbound. I-10 – Beaumont, Houston I-10 exit 799. ^ Grand Parkway Association. "Grand Parkway Segments". Retrieved 2008-08-13. ^ a b "Texas 130 toll road on edge of default". Houston Chronicle. Retrieved June 19, 2014. ^ "Grand Parkway Segment C work scheduled". Retrieved September 6, 2018. ^ "Toll Rates - Fort Bend County Toll Road Authority". Retrieved April 21, 2014. ^ fbctrac1. "Current Projects - Fort Bend County Toll Road Authority". fbctra.com. Archived from the original on 2014-03-06. ^ a b c "West Houston Association". westhouston.org. Archived from the original on 2011-08-12. ^ RAD SALLEE (2007-06-03). "Fast lane sought for parkway plan". Houston Chronicle. Retrieved 2007-06-04. ^ a b "Grand Parkway, Cy-Fair - Community Impact Newspaper". Community Impact Newspaper. ^ a b "New section of Grand Parkway opens early". ABC13 Houston. ^ Begley, Dug. "Grand Parkway frontage roads open to ease flow around I-45". Houston Chronicle. Retrieved April 11, 2015. ^ "Hardy Toll Road goes EZ Tag only". KHOU 11 News. ^ TxDOT (2017-03-30). "Texas Transportation Commission Awards Design-Build Contract for SH 99 (Grand Parkway) Segments H, I-1, I-2 in Houston and Beaumont Districts". Retrieved 2017-06-15. ^ "Rates". Texas Department of Transportation. Retrieved October 17, 2011. ^ Kevin Quinn (2007-05-31). "Residents suffer from Grand Parkway growing pains". abc13.com. Retrieved 2007-06-01. ^ Betty L. Martin (2007-05-23). "Parkway toll plan gets mixed reaction". Houston Chronicle. Retrieved 2007-06-01. ^ Progress on Grand Parkway moving slowly. John Tompkins, The Facts. November 12, 2006. Last accessed November 26, 2006. ^ "Grand Parkway". grandpky.com. Archived from the original on 2014-09-03. ^ Construction in April 2016 closed turnaround. Jersey barriers now block both sides of the former northbound "Texas U-turn lane", as well as the nominal 4 through lanes of the long abandoned proposed interchange. Southbound u-turn lane access was narrowed considerably and is now for official and emergency vehicle use only. Largely considered to be the most dangerous strectch of segment D, and it is the only portion of section D to have a maximum speed limit of 50 mph. Further safety concerns due to traffic level increase coupled with scant development south of the current terminus of Peek Road also factored heavily into the decision to abandon the interchange. Begley, Dug. "Grand Parkway segment on pace for December opening." Houston Chronicle. June 17, 2013. Wikimedia Commons has media related to Texas State Highway 99. Kirk, Bryan. "Segments of Grand Parkway are taking shape." Houston Chronicle. Tuesday April 17, 2012. This page was last edited on 5 March 2019, at 22:32 (UTC).